READING, PA – The Neag Planetarium at the Reading Public Museum will close from January 22 – February 13, 2018 to install its new projection system. After receiving funds from the Wyncote Foundation, the planetarium will be the first of its kind in Pennsylvania to have the SCIDome IQ 4K Laser system. 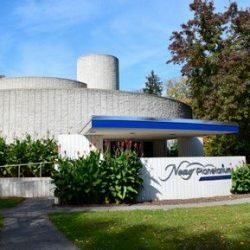 Confirmed by Spitz Incorporated, manufacturer of the system, the Neag Planetarium will be the first SciDome 4K system north of the Mason-Dixon Line, as well as being the first laser-illuminated fulldome planetarium in the state of Pennsylvania. The SciDome IQ 4K quadruples the video resolution with using a new Laser Phosphor light source which produces higher, and brighter video resolutions than traditional lamp-based projectors. The new system will use two digital projectors instead of one, installed on opposite sides of the dome, to create one large image. The projectors will be out of the viewer’s line of sight. “Visitors will immediately notice the lack of a projector in the center of the planetarium chamber, something that’s been a staple since its opening in 1968. This will open up the chamber for more creative use of the floor, and provide additional space during special events and rentals,” said Mark Mazurkiewicz, Director of the Neag Planetarium. All previous projection systems have been Spitz Incorporated products, a company based in Chadds Ford, PA. Prior to the 2006 projector (Spitz SciDome 1024) the planetarium used a Spitz A4 optical mechanical projector, installed in late 1968. This year also marks the 50th Anniversary of the Neag Planetarium. To celebrate, The Museum is hosting a private celebration for Museum Supporters with a tour of the brand-new Animal Habitats Gallery and a dinner inside the planetarium on February 21, at 5 p.m. The planetarium will re-open on Wednesday, February 14 for school tours and public star shows beginning at 2, 3, and 4 p.m. For complete schedule, please see The Museum’s website.